New information shows that UNRWA (as well as international organizations such as Islamic Relief Worldwide, IHH and Mercy Malaysia, is working in coordination with the Charitable Association For Palestinian Relief – CAPR. Founded in 2004, the Charitable Association For Palestinian Relief – CAPR (الهيئة الخيرية لإغاثة الشعب الفلسطيني) is a charitable organization affiliated with the Palestinian Islamic Jihad, a designated terrorist entity by the United States, the European Union, the United Kingdom, Japan, Canada, Australia, New Zealand and Israel. In May 2014, a delegation of the Charitable Association For Palestinian Relief (CAPR) attended the international conference for the liberation of al-Aqsa Mosque that took place in Malaysia. The delegation included: Khalid Abu Samarah, CAPR President, Omar Shalah, Head of CAPR Gaza Office and Hisham Musa, CAPR representative in Malaysia. In his speech at the conference, Khalid Abu Samarah emphasized all Muslims have a (religious) duty to carry out the jihad to liberate al-Aqsa Mosque. January 18, 2016 – “After UNRWA provided a new round of financial support for the Palestinian refugees and facilitated the authorization [process] for the receiving the [financial] support, [UNRWA] in cooperation CAPR opened a centre in Karam al-Alali in Qudsaya [rural area of Damascus]. #CAPR.” Poster of CAPR on UNRWA’s financial support. 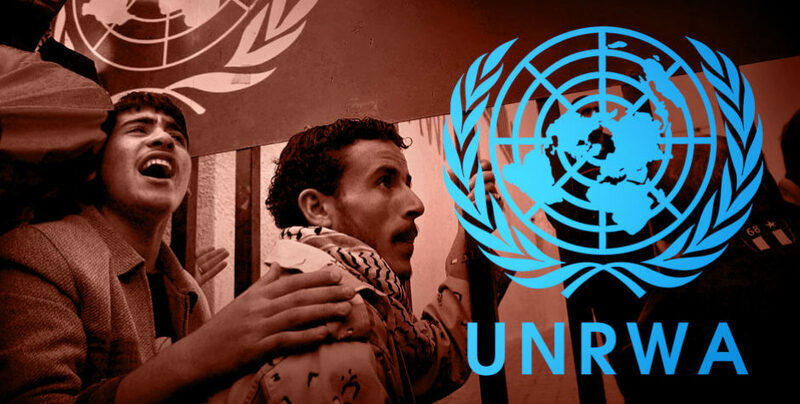 CAPR activists were documented facilitating UNRWA’s financial support for beneficiaries. January 9, 2016 – “The team of “Syria Warm Winter” continues its campaign visiting the refuge centre supervised by UNRWA in Sahnaya and Jarmana camp…” See also reports on January 6, 2016, January 6, 2016 and on January 14, 2016. September 16, 2015 – “UNRWA provides 3,000 school bags to students of the schools at Khan Dannun camp [in southern Syria) Wednesday (9/16). These [school] bags are provided by Al Marhama campaign in cooperation with the Charitable Association For Palestinian Relief.” Activists with the Charitable Association For Palestinian Relief were documented handing out the school bags to the UNRWA students. See also report on September 17, 2015. March 26, 2015 – “#CAPR. On Thursday (26/3), the charity visited students of elementary schools in Qudsaya and in cooperation with UNRWA it provided them with healthy shampoos, vitamin [tablets] and intestinal disinfectant tablets. It was agreed upon with school principals to further cooperate soon with CAPR in the field of development and psychological support. #CAPR.” CAPR activists were documented engaging with the students.